This place became the first icon of tourist attractions in Batam proclaimed in the era of President Habibie. As a liaison between islands in the eccentric and girder, something was missing if you have not been to this bridge. 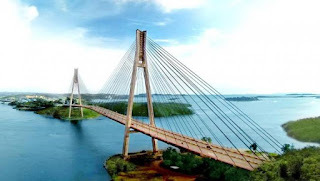 So almost every travel agent always enter destinations traveled to bridge this Barelang in ittenerary offers. Barelang Bridge Batam has become a favorite tourist spot for the people of Batam, every holiday or weekend the place is always full of visitors. Culinary favorite here is grilled or fried corn meal of crab and shrimp are often sold local traders. Usually the visitors come just to relax unwind after a week working at the factory by the way enjoy the view of small islands and the expanse of sea water are on the bridge while enjoying the beach breeze that tends tight.